We are happy to announce that we now support billing accounts on Scribie.com. Billing accounts are where you can order your transcripts online and pay on a Net 15 or Net 30 basis. We send you a bill at the end of the month or whenever you request it. The volume requirement for billing accounts are higher though. We can only consider it for order amounts of more than $1000. We also require a contract to be signed before the billing account can be set up. We were unable to support billing accounts previously as we followed a different model where we paid our transcribers as soon as their work was reviewed. That meant that we had to charge our customers upfront. This was radically different from other freelance marketplaces where there are restrictions on withdrawal of earnings. We decided to do away with such restrictions as our aim was to build the best place for audio/video transcription. But Net billing is an important requirement for Enterprises and SMEs and many of our customers requested it. Our solution to this problem was to get a line of credit from our bank. We finally got the approval for it last week. A big shout out to our bankers for this! So if you are looking for a billing account with us, just get in touch with us and we will start the process. 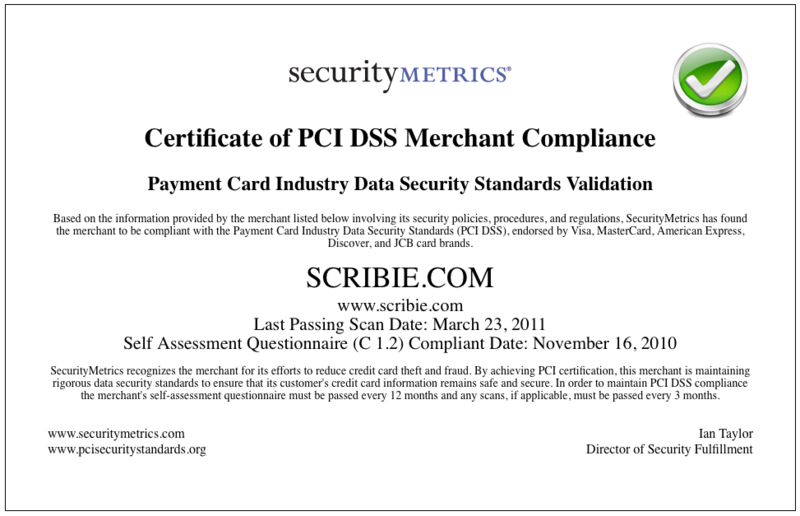 Scribie.com is now PCI DSS Compliant. PCI Compliance is an essential requirement for processing credit card payment on any website. This certificate shows that Scribie.com adheres to PCI compliance standards. We do not store any credit card data on our server anytime; not in logs, not in the database or anywhere else. The data is passed securely using HTTPS to our payment processor’s gateway, Braintree Payments. Braintree is itself PCI DSS Level 1 compliant and they talk to the merchant account providers to charge the credit card. We are responsible with your credit card data and ensure that your data is not compromised in any way when you make a payment on Scribie.com.